Thank you for visiting us. If this is your first time visit, please feel free to use our search feature to find what you're looking for quickly. You can also choose to register. Creating an account will allow you to track which ornaments you've given to recipients in the past, and help you plan this year's list. Since 1997, our buyers work year-around searching for unique personalized Christmas ornaments for every life occasion, event, and celebration. 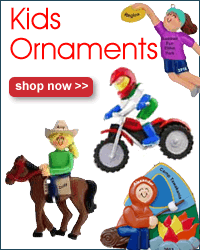 Our family Christmas ornaments are located on their own category page. 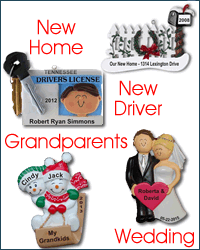 Click the banner below to find ornaments for Mom, Dad, Daughter, Son, Grandparents, Aunt, Uncle & Godparents. On most family ornaments, you can add your favorite dogs and/or cats. Check under the OPTIONS+ red banner on the ornament page. There's nothing more fun than traveling to fascinating, fun and relaxing places. The next best thing is finding just the right travel ornament as a memento of your trip. There are so many options, we've split them into categories. You can find beach themes; foreign and famous destination themes; nature vacations like mountain hiking or white water rafting; and the all-time favorite cruise ship ornaments that can be personalized with your specific ports of call. We also offer airplane and helicopter ornaments for a child's first plane ride ornament or first thrilling ride in a helicopter looking over Maui or mountain skiing. If you know exactly what you're looking for, type a keyword into our search feature and we'll pull up the exact matches for you. Or, browse the primary categories to see all of the ornaments that best commemorates your exciting travel, trip or vacation. 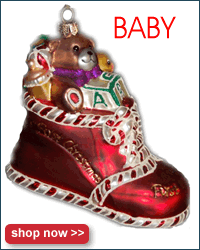 If you are an advertising agency or a business looking for a custom ornament created to advertise your business, please click here for custom Christmas ornaments.